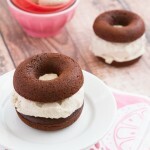 Grain-free and vegan cake donuts made with chickpea flour and rich cacao powder. Perfect for ice cream sandwiches! Preheat oven to 350F and lightly oil two medium-sized donut pans with cooking spray or oil with a dab of coconut oil. Do not skip this step! Set aside. Add all dry ingredients to a bowl. Whisk to combine, then set aside. Add all wet ingredients to a small saucepan. Heat on medium heat until boiling. Pour wet mixture into the dry ingredients bowl and stir with a spoon until mixed. Sit aside for 3 minutes to thicken. Transfer donut batter to a piping bag or large plastic bag and clip the end. Pipe the batter into each donut cavity, making a total of 10 donuts. Bake in preheated oven for 11-13 minutes, until a toothpick inserted comes out clean. Allow donuts to cool in the pan for 5 minutes before flipping over and tapping the back of the donut pan. The donuts should pop out easily. Transfer to a cooling rack and cool completely, about an hour. 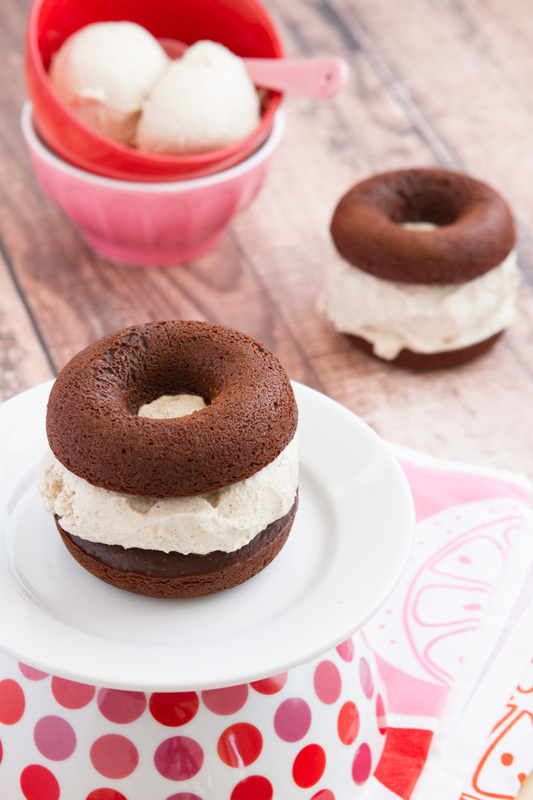 Use as the sandwich pieces to vegan and grain-free ice cream sandwiches. Get the Sugar-free Vanilla Bean Ice Cream recipe. Cut donuts in half and use the ice cream as filling. Once sandwiches are assembled, they can be eaten immediately or stored in an airtight container for up to 1 week. When ready to consume, remove from the freezer and let the sandwiches thaw for 5-10 minutes.